It’s the time of the year where food options can be tyrannously pumpkiny. The word pumpkin is used indiscriminately in front of words like bread, muffins, and improbably, Chai. Like the sound of rustling leaves, pumpkins are a simple seasonal pleasure. They’re orange, they get carved at Halloween, pie’d at Thanksgiving and in recent years, turned into a viable bagel option three months of the year. All the talk of pumpkin is so evocative, the smell cinnamon, clove and nutmeg seems to be wafting in the air. Well, actually, it turns out that’s the collective scent escaping from all the pumpkin spice lattes in the NW. 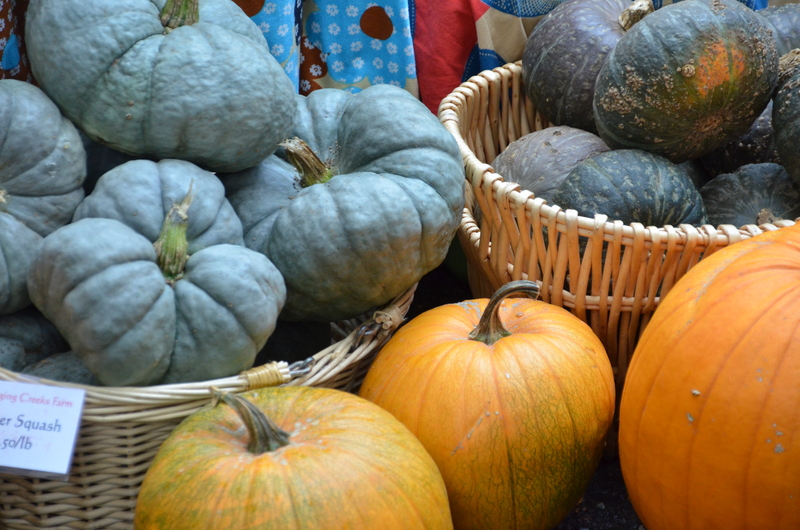 Since we’ve reached peak pumpkin, let’s learn more about the iconic squash. The orange veg (Like a tomato, it’s botanically a fruit) is thought of as a Winter Squash, but a pumpkin is genetically closer to the zucchini than the butternut. And speaking of butternuts, Libby’s, the company who processes over 80% of all pumpkin consumed in the States, uses a proprietary type of butternut squash for it’s “canned pumpkin.” Market goers with DIY streak can find pie or sugar pumpkins to break down into pie: They’re smaller but are the same familiar color and shape. Ask your farmer about what makes the best filling. The jack-o-lantern is far too big and watery to be used culinarily, and to add a deeper level of confusion, given its attributes, the pumpkin we carve up for Halloween celebrations might be more accurately described as a gourd. The bromide, that all pumpkins are squashes, but not all squashes are pumpkins is a reminder there are hundreds of squashes grown commercially and avocationally. Summer squashes, yellow crookneck, patty pans are picked young while they’re still tender, or should be – um, listen in, zucchini. 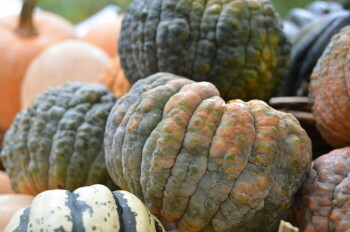 While the squashes that are allowed to mature on the vine: Hubbard, acorn, butternut, delicata, Kuri, Cushaw, turban and hundreds of other cultivars, landraces and varieties are generically referred to as Winter Squashes. These can be used somewhat interchangeably culinarily, although nothing quite replicates the texture of spaghetti squash. About 8,000 years ago humans began purposefully cultivating squash in what is now central Mexico; possibly for its seeds. The wild plant was so important in the Americas, it was ultimately domesticated independently in five different in locations from southern Canada to South America. Squash had been grown in New England for around a millennium before the pilgrims ‘discovered’ them and turned it into a Thanksgiving legend. The pumpkin spices are so good, it’s easy to forget squash’s bad boy, savory side. They can be used in soup or for those who enjoy a more luxurious spoonful, bisque. Try making enchiladas – pinto beans and roasted squash wrapped in corn tortillas and topped with tomato-pepper sauce – it’s so very good it proves another foodist bromide: Things that grow together, go together. Squash risotto or agnolotti; a squash filled ravioli, first blanched, then fried in brown butter and sage: Either are enough to make you weep for the memory of your Italian grandmother; even/especially if you never had one. Thai pumpkin curry, sweet, spicy, squashy. Pierce the side of Delicata squash and par-cook in a microwave, before scooping, slicing and pan frying with butter and onions. Hollow out an acorn squash, fill it with a ragu and bake until tender. And that’s the great thing about squash, there is no bad way to prepare them, just relax, sip your Pumpkintini and think about your next meal, if it’s squashy, it’ll be good.